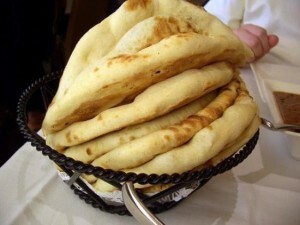 Naan recipe by Susheel at DesiRecipes.com. Crispy homemade naan that goes with all kind of dishes usually serve in parties. Serve this delicious bread straight from the oven, with popular dishes like Tandoori Chicken or kababs of different kinds. Sift flour, baking powder or baking soda and salt together in a bowl. Stir in egg, yogurt and 2 tablespoons of the butter. Gradually stir in enough milk to make a soft dough. Cover with a damp cloth and place in a warm place for 2 hours. Preheat oven to 400 degrees F (205 C) Knead dough on a floured surface for 2 or 3 minutes until smooth. Divide into 8 pieces Roll each piece into a ball then into ovals about 6inches long. If you must use a baking sheet, grease it and brush the underside of the bread with water. Brush the other side with butter and sprinkle poppy seeds . Bake 6 to 10 minutes until puffy and golden brown. i,ll try it today .... but i think yeast is also necessary . can any one tell me how can i make them on stove? Thanks for prompting the quantity of baking powder, it has been fixed.